Alstom has won contracts to install its Urbalis 400 solution – its latest-generation CBTC technology – on the Mumbai and Pune metros. Specifically, Alstom will fit this solution on lines 2A, 2B and 7 of the Mumbai Metro and lines 1 and 2 of the Pune Metro. Together, these contracts are worth more than 90 million euros (101 million USD). The Delhi Metro Rail Corporation Ltd (DMRC) awarded the contract to Alstom for the Mumbai Metro. 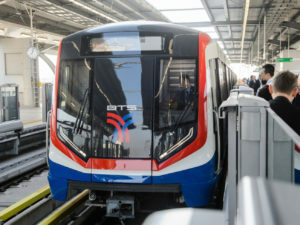 Alstom is to supply both the CBTC signalling solution and a modern telecommunications system for the metro’s three elevated lines. Because of the lines’ combined lengths, this contract is one of the biggest signalling projects in India. The contract’s signalling component includes the design, manufacture, supply, installation, testing and commissioning of the Urbalis 400 system. It further includes the supply and commissioning of the on-board equipment for 63 trains. The telecommunications component includes public address systems, passenger information displays, fibre optic transmission systems, CCTV and access control systems. Lines 2A and 2B of the Mumbai Metro are under construction and should open in 2022. Line 7 is also under construction. The Maha Metro Rail Corporation Ltd (MMRCL) awarded the contract to Alstom for the Pune Metro. Alstom will supply its Urbalis 400 solution for lines 1 and 2. The signalling solution will then control 31 trains over 32km. Consequently, the trains can run at higher frequencies and speed, thereby increasing capacity without impacting safety. To date, the Urbalis 400 solution is in use in more than 30 cities globally.